The dull pain starts behind your eye, like it always does when you are stressed and overtired. You know that a migraine is developing, and start to wonder how you will manage this one. Grandma always told you to turn off the lights and apply hot compresses to your forehead. Your co-worker swears by her mega-doses of Vitamin B Complex. You love the convenience of over-the-counter combination analgesics with caffeine. You have heard of prescription nasal sprays, pain killers classified as controlled substances, and even something about injected bacterial toxins. There are as many choices for treating migraines. What worked once for you does not work every time. Some medications take the edge off the pain, but cause other problems including nausea or tiredness. Some medications have lingering side effects or could be causing more serious problems later in life. 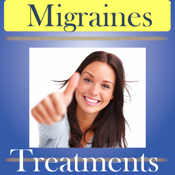 Migraine Treatments provides an in depth review of the available treatments, from home remedies to prescription drugs, and sprays to injections. -Migraine Trivia - Test Your Knowledge!